Everything Points to Yeshua—Even the Smallest Details! Exodus 29:12, Horns of the altar. The four horns of the altar of sacrifice was the place where the blood of atonement was sprinkled (also Lev 4:4, 17, 18, 25, 30, 34; 8:15; 9:9; 16:18). But there’s more. Horn is the Hebrew word qeren meaning “horn, hill or ray.” This word is used to describe the rays of light rays emanating from the face of Moses after his encounter with YHVH (Exod 34:29) and the horns of an animal (Ps 69:31). In ancient cultures, the horn was a metaphor for physical strength or spiritual power (Deut 33:17; 2 Sam 22:3; Ps 18:2). Elsewhere, YHVH is referred to as man’s “horn of salvation” meaning he is the strength of our salvation. The Hebrew word for salvation is yesha meaning “deliverance, rescue, safety, welfare, victory, prosperity.” The root of yesha is the verb yasha meaning “to save, to deliver, to give victory.” Not only is YHVH called our “horn of salvation” in the Tanakh, but this designation is applied to Yeshua as well in the Testimony of Yeshua (Luke 1:69). Interestingly, Yeshua is a derivative of the Hebrew name Yehoshua (or Joshua), which also derives from yasha. It should be evident from this quick study that the horns of the altar are a picture of Yeshua, who is the horn or strength of our salvation and who shed his blood for our sins on the altar of the cross. This being the case, why then are there four horns on the altar? This is likely symbolic of the four attributes of Yeshua, even as the four colors of cloth used throughout the tabernacle prophetically symbolize the same thing. Crimson speaks to Yeshua’s humanity, purple to his kingship, blue to his divinity, and white to his sinlessness or righteousness. Additionally, the Jewish sages view the four horns as symbolizing the four corners of the earth, for, in Hebraic thought, the earth is nothing more than a large altar dedicated to Elohim. (See The ArtScroll Tehilim/Psalms commentary on this verse and notes at Ps 118:27.) The horns on the four corners of the altar could also prophetically point to the fact that Yeshua came to save all humans (who would trust in him) from the four corners of the earth. Exodus 27:1–8, An altar. Just inside the door of the tabernacle was the altar of sacrifice. It was made of acacia wood overlaid with bronze, which is a shadow picture of Yeshua bearing the judgment for men’s sins on the cross. The blood of the sacrifice was poured out on the ground at the base of the altar picturing Yeshua shedding his blood at the cross. Two lambs were offered at the altar morning and evening (Exod 29:38–42). This pictures our need to come humbly before our Father in heaven morning and evening in prayerful devotion as living sacrifices to confess our sins, to praise and thank him (Ps 51:16–17; Heb 13:15; 1 John 1:7–9). The Altar of Sacrifice in More Details. Upon understanding that the Person and work of Yeshua is the way into life, spiritual light and truth, one must also recognize that one’s sin liability keeps one from a having personal relationship with one’s Creator. The broken fellowship with one’s Creator due to the uncleanness of sin is the reason for this. For one to have a relationship with a sinless, perfect, totally set-apart or holy Elohim,the sin problem has to be dealt with. Sin must be atoned along with the resulting guilt, shame and penalty (death) that sin brings. 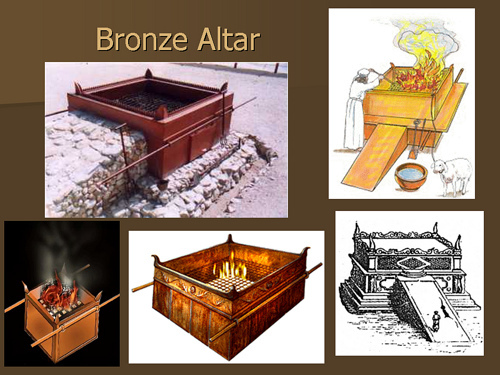 In the Tabernacle of Moses, liability and effect of sin is dealt with at the altar of the red heifer outside the gate of the tabernacle, which represents the work of Yeshua at the cross (Heb 13:10–13). There one was purified and made ready to come into the actual tabernacle. 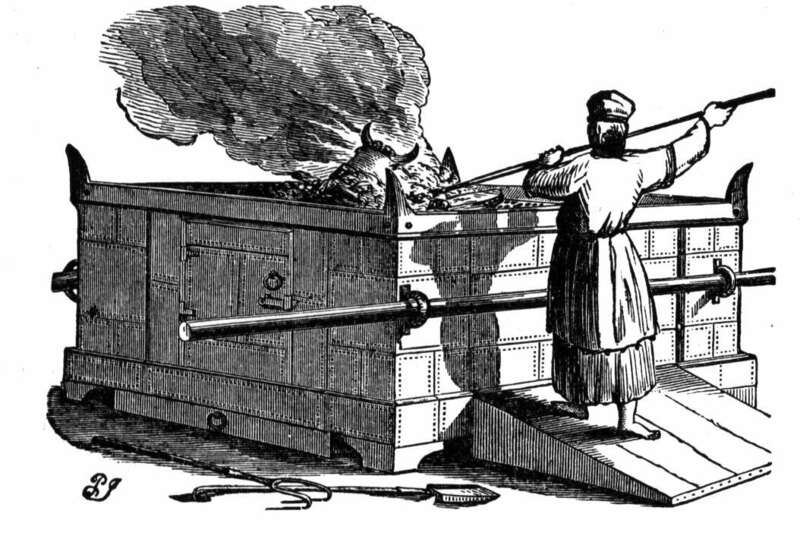 Upon doing so, the first thing one encountered when entering the tabernacle was the altar of sacrifice where both kosher animals and unleavened bread (made of the finest flour and the purest olive oil) were offered, and a fermented wine libation was poured out twice daily (morning and afternoon, Num 28:1–8). These all picture the body of Yeshua being broken and slain for us and our need to “eat” his body and “drink” his blood in a spiritual sense (John 6:35–58). The supper on Passover night which overlaps on to the first Sabbath of the Feast of Unleavened Bread is also picture of this since the participants would eat fire-roasted lamb, unleavened bread and fermented wine. The fire on the altar was to be kept burning at all times; it was never to go out (Lev 6:13). Additionally, before ministering at the altar, a priest was to always wash his hands and feet at the bronze laver (Exod 30:17–21) and to put on the priestly robes (Lev 6:10). These things are prophetic shadows that point to the ministry of Yeshua before the throne of the Father in heaven. There, as our heavenly high priest, he, in an ultimate state of purity and perfection he is ever making intercession for us and reconciling us to the Father (Eph 2:18; 1 Tim 2:5; Heb 7:25–26; 8:1–2, 5–6; 9:11–22; 10:19–22; 1 John 2:1). At the twice daily offering (the morning shacharit and the afternoon minchah), a yearling lamb was sacrificed on the north side of the altar, or its left side as viewed from the holy of holies, which represents the throne of Elohim. (Furthermore, north is significant since Scripture seems to indicate that the third heaven where Elohim dwells is in the northern region of the sky [Isa 14:13].) The lamb’s blood was then sprinkled round about the altar as an atonement for sin, while a wine libation was poured out onto the altar, and unleavened bread was cooked and offered at the same time on the altar (Num 28:1–8; Lev 1:11). The fact that the lamb was killed on the north or left side of the altar is prophetically significant since it points to Yeshua’s first coming as the Suffering Servant Messiah, the Lamb of Elohim. The left side is significant since the left hand (usually the weaker hand), in Jewish thought, represents grace and mercy, while the right hand (usually the stronger hand) represents strength, power and judgment. At his first coming, Yeshua was like a lamb led to the slaughter (Isa 52:13–53:12, especially note 53:7) as he spilled his blood as an atonement for men’s sins (Isa 53:5–6,10). Upon his death and glorious resurrection, he returned to heaven where he took his rightful place as the right arm of YHVH Elohim (Acts 7:55–56; Rom 8:34). At Yeshua’s second coming, he will come, not as a lamb led to the slaughter this time, but in power and glory as a warrior on a white stallion to judge the wicked and to reward the righteous. After that, he will assume his position as King of kings and Lord of lords over the earth during the Millennium as revealed in the Book of Revelation. 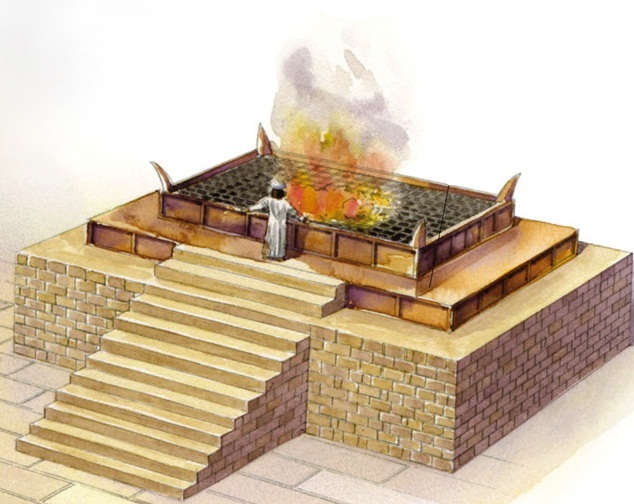 Now let’s consider the actual construction of the altar of sacrifice to see how it pointed prophetically to Yeshua in other ways. It was constructed of acacia wood overlaid in bronze. Wood and trees represent men (Ps 1:1,3; Jer 5:14). Yeshua was a carpenter. Bronze speaks of judgment. Yeshua, a man who worked in wood (representing humanity) and died on a tree took the fire of judgment upon himself for humanity’s sins. All the animals slaughtered in the sacrificial system were similar to the minimum amount due on a credit card statement of a bill so huge one cannot possible pay the balance, so one pays the minimum until somehow, miraculously, someone will step in to pay the full amount. Yeshua paid that debt for each of us at the cross. The first sacrifice was lit by fire from heaven. This signifies that the blood of Yeshua delivers us from the wrath of Elohim (Rom 5:9). YHVH sent fire from heaven once to light the altar of sacrifice, but it was up to the priests to maintain that fire. The fire had to be constantly fed and the old ashes had to be removed to keep the fire burning. Similarly, when a person is redeemed spiritually and born again by the Spirit of Elohim, he has to maintain the spiritual fire in his life to ensure that it doesn’t die out due to lack of fuel, or get choked due to the ashes of traditions and dead works. Offerings were made on the altar of sacrifice in the morning and in the evening. This teaches us that twice daily we must come before YHVH’s throne in heaven and at the altar there leave our prayers and confess our sins (1 John 1:9), drawing close to our loving Creator in communion and devotion of service to him. What is prophetic significance of the four horns of the altar? Horn in Hebrew is qeren meaning “horn, hill or ray.” This word is used to describe the rays of light rays emanating from the face of Moses after his encounter with YHVH (Exod 34:29) and the horns of an animal (Ps 69:31). In ancient cultures, the horn was a metaphor for physical strength or spiritual power (Deut 33:17; 2 Sam 22:3; Ps 18:2). Elsewhere, YHVH is referred to as man’s “horn of salvation” meaning he is the strength of our salvation. The Hebrew word for salvation is yesha meaning “deliverance, rescue, safety, welfare, victory, prosperity.” The root of yesha is the verb yasha meaning “to save, to deliver, to give victory.” Not only is YHVH called our “horn of salvation” in the Tanakh, but this designation is applied to Yeshua as well in the Testimony of Yeshua (Luke 1:69). Interestingly, Yeshua is a derivative of the Hebrew name Yehoshua (or Joshua), which also derives from yasha. It should be evident from this quick study that the horns of the altar are a picture of Yeshua, who is the horn or strength of our salvation and who shed his blood for our sins on the altar of the cross. This being the case, why then are there four horns on the altar? This is likely symbolic of the four attributes of Yeshua, even as the four colors of cloth used throughout the tabernacle prophetically symbolize the same thing: crimson speaks to Yeshua’s humanity, purple to his kingship, blue to his divinity, and white to his sinlessness or righteousness. Additionally, the Jewish sages view the four horns as symbolizing the four corners of the earth, for, in Hebraic thought, the earth is nothing more than a large altar dedicated to Elohim. Leviticus 7:26, Not eat any blood. YHVH revealed in the Torah that the life of flesh is in the blood (Lev 17:11). Therefore, the blood symbolizes the whole life of the living being. This is why the blood being poured upon the altar made atonement for the souls of men (Lev 17:11), since it represented and pointed to the shedding of Yeshua’s blood when he sacrificed his life on the cross in atoning for men’s sins. Respecting the blood is necessary not only because it symbolizes the sanctity of the life of man who was made in the Creator’s image (Gen 1:26 cp. 9:6), but more importantly, because of the blood of Elohim’s Son that was shed for man’s redemption (Lev 17:11). For one to eat the blood showed disdain for what the blood typifies. In times past, such a violation resulted in the punishment of being banished from the nation of Israel. The blood was to be reserved for the sacrificial service where it was used symbolically to represent Yeshua’s shedding his blood on the cross. The blood of a lamb was put on the door posts to protect men from YHVH’s judgment against sin (Exod 12:7,13). Moses sprinkled the blood of oxen on the people symbolizing their coming into covenantal relationship with YHVH (Exod 24:5–8). Additionally, the blood of sacrificed animals was sprinkled throughout the tabernacle, on Aaron and his sons, and all around the altar to sanctify it. 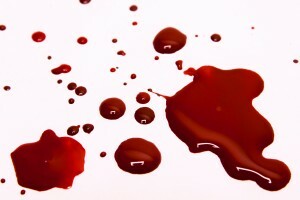 All these acts and uses of the blood were illustrative of the unrestricted cleansing power of the blood of Yeshua, which is why YHVH expected his people to treat the blood with a reverence. Those who didn’t evidenced a heart of indifference for the set-apart or kadosh things of Elohim—an intolerable offence in the Creator’s eyes.